April 30, 2016. The Florida Wedding of Clara & Joe at The Santa Lucia Riverclub at Ballantrae in Pt St Lucie, Florida. One of the most picturesque venues in the area and also one of if not the best values in all of florida. 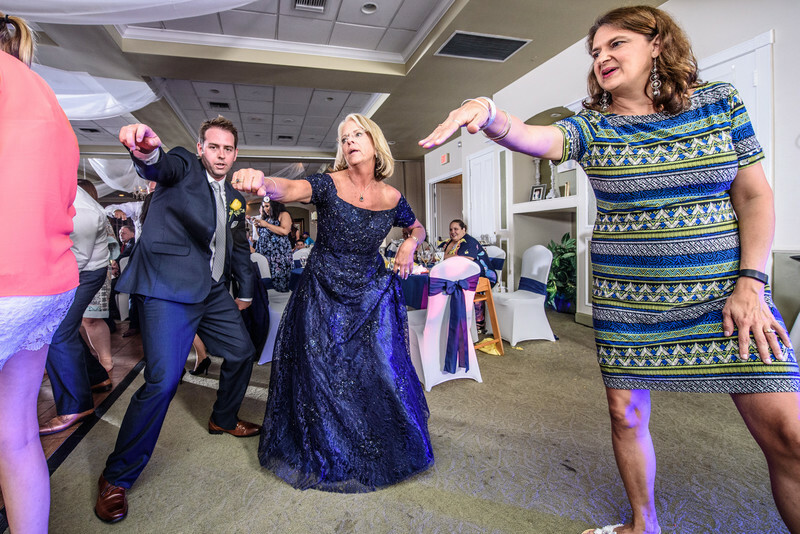 Here you can see the groom and his mother and friends really getting down during their wedding reception celebration. Another great example of the use of professional grade off camera lighting to ensure that every exposure is perfect even in a darkened room like your wedding reception. This allows us to concentrate fully on capturing the moment, without concern for it being correctly exposed. No other company does reception coverage quite the same way, and end up fighting to get the exposure correct all night long. We look to get the great shots, while they look to find the right exposure. Huge difference in the resulting images. If you are a photographer and want to learn off camera lighting techniques so you can make shots like this simple, give us a call, as we do lighting seminars and tutoring as well. Let us show you how!